FEBRUARY 2009 | SDTEKKEN.COM - TEKKEN News Resource! From CHALLENGER.JP, a new Tekken 6: BR vid from Challenger! Check out this tournament match between Law vs Feng Wei! kobp999’s YouTube – More Japanese T6BR videos! This one features various combos with Lee, Steve, and more… Check them out! TEKKEN CRASH! Jon747 has uploaded some of the episode portions of the new Korean Tekken show, check them out! Check out the first BR Death combo from KaNE of SuperArcadeBox! KIOIN has put together some videos featuring some various combos with Julia for T6BR! Check them out here. kiriasigokou’s YouTube – More match videos from Japan! Check out the BR action featuring Heihachi, Anna and more! Look at Heihachi in PlayStation HOME! Check out our front page for some new screen shots of Tekken 6: BR for home consoles! From CHALLENGER.JP, a new Tekken 6: BR vid from Challenger! Check out this tournament match between Alisa vs Jack-6! ami1879’s YouTube – More Tekken 6: Bloodline Rebellion match videos from Japan! This batch features a good variety of characters. Korean MBC Game TV show TEKKEN CRASH has started airing! Check out the latest details and videos courtesy of jAy-kEi on Tekken Zaibatsu forums! JOYBOX has updated with some new T6BR match videos! Check out this new one featuring Tetsuo’s Lei! Carloud’s YouTube – New match videos from the Philippines! Check them out! From CHALLENGER.JP, a new Tekken 6: BR vid from Challenger! Check out this tournament match between Paul and Alisa! Check our front page for a big interview update from Namco’s Katsuhiro Harada and check out this new teaser trailer for TEKKEN 6! 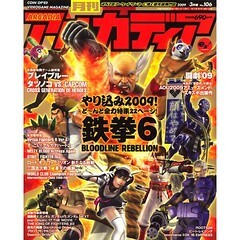 Tekken 6: Bloodline Rebellion is gracing the cover of the newest issue of Arcadia Magazine in Japan! If you’d like to get this issue you can do so by ordering at Play-Asia, follow this link here. Antikristdeathmetal’s YouTube – New Tekken 6: BR match videos from the Philippines! Check out action featuring a variety of characters! explodia12’s YouTube – More Tekken 6: BR action from the Philippines! Check it out!